It’s that time again, when the OIG publishes its annual Work Plan for the coming year, providing insight and a proverbial “heads up” on the areas where potential concern and program integrity efforts are being focused. Many of the focus areas are ongoing or have been the subject of previous Work Plans, and come as no surprise. Nevertheless, it is important for practitioners to familiarize or reacquaint themselves with the 2013 Work Plan projects in order to recognize and prioritize compliance areas currently on the OIG’s radar. Of particular interest for practitioners are the various OIG review projects involving ancillary services. For example, the OIG is looking at outpatient therapy services by independent therapists, and will focus on high utilization of physical therapy to determine if claims were reasonable, medically necessary and properly documented. Similarly, high-cost diagnostic radiological tests ordered by primary care and specialty physicians are being reviewed to determine whether utilization rates match industry practices. The OIG also will review Part B payments for imaging services with an eye towards determining if utilization rates reflect industry practices and if practice expenses components within payment rates are commensurate with costs incurred. Electrodiagnostic testing (needle electromyogram and never conduction) is a new area under review, particularly with respect to utilization rates by specialty, the concern being that such services are vulnerable to abuse and inappropriate financial gain. Errors in billing and claims administration are also the subject of OIG review, with perennially recurring projects directed at incident-to services, place of service coding and E/M services. A 2009 OIG review of prior claims found that non-physician practitioners often were not properly supervised or that unqualified non-physician practitioners performed services, in each case, resulting in payments that were not compensable. Since Medicare payment for services in a non-facility setting, like a physician’s office, is often higher than in the rate that applies in other service locations, there is also concern over whether claims for Part B services performed in ASCs and Hospital outpatient departments were coded with the proper place of service. Another, more recent area of focus involves the documentation supporting E/M services and questions whether Electronic Medical Record documentation processes may result in “cloned” entries (and potentially improper claims) rather than a deliberate process of selecting proper codes based on content of actual service. Part B payment for chiropractic services are also being reviewed, with this area being the subject of ongoing OIG concern since chiropractic maintenance therapy being considered not medically necessary. Apparently echoing a series of fairly recent OIG Advisory opinions, the 2013 Work Plan also identifies Polysomnography and Sleep Disorder Clinics as areas of potentially questionable billing patterns and possible overutilization. High utilization rates have also raised questions regarding whether services are duplicative of diagnostic testing performed previously by attending physicians. Another ongoing and increasing focus of OIG scrutiny is physician-owned distributors (POD) of high utilization orthopedic implant devices. 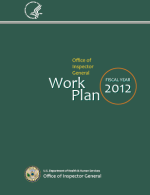 The Work Plan for 2013 specifically identifies PODs which provide hospitals with spinal fusion implant devices as being under OIG review to determine if such arrangements are associated with high utilization. These are just some of the many areas of OIG review with which practitioners and facilities alike should become familiar in order to remain current with the health care regulatory compliance curve. This entry was posted in Advisory Opinions, Compliance Plans, Corporate Law, Department of Justice, FHLF Monthly Newsletter, Group Practice Concerns, Healthcare Law, OIG Investigations, OIG Studies, Physician Issues and tagged 2012 OIG Work Plan, compliance, electromyogram, Electronic Medical Record documentation, Incident-To Services, Medicare Part B, OIG, outpatient therapy services, Polysomnography. Bookmark the permalink.